The Integral Fusion 3.0 is a capless, small and lightweight leave-in' metal USB 3.0 Flash Drive measuring only 21 x 12 x 4.5 mm, yet offering capacities up to 32 GB. Integral Memory plc has been around since 1989, starting its activity in the UK. Now, its products are sold in over 50 countries, the Integral brand being well known as a producer of various memory and storage products, including SSDs and USB drives. 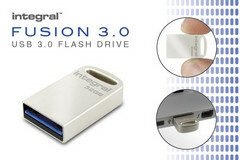 The Integral Fusion 3.0 was announced this Monday and may be the world's smallest 32 GB flash drive. The Fusion 3.0 has a low-profile metal casing and measures only 0.82 x 0.47 x 0.17 inches, being the smallest in the Integral range. This USB 3.0 device is fully compatible with USB 2.0 as well, offering speeds of up to 140 MB/s when reading and write speeds as high as 20 MB/s. Unlike some other USB flash drives, the Integral Fusion 3.0 is fully compatible with Windows XP, Vista, 7 and 8, Mac OS X 10.0 or later and even Linux 2.4.0 or above. Supplied with keylace, it comes with 2 years of warranty and can be purchased for $13, $20 or $32, depending on the size chosen (8, 16 and 32 GB versions are available).